Project 1: Impressionist Help Session. 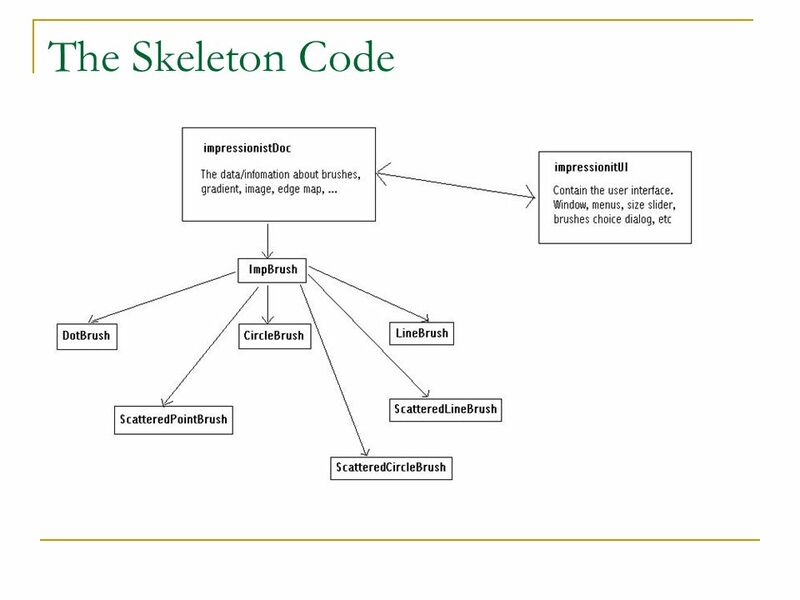 The Skeleton Code. 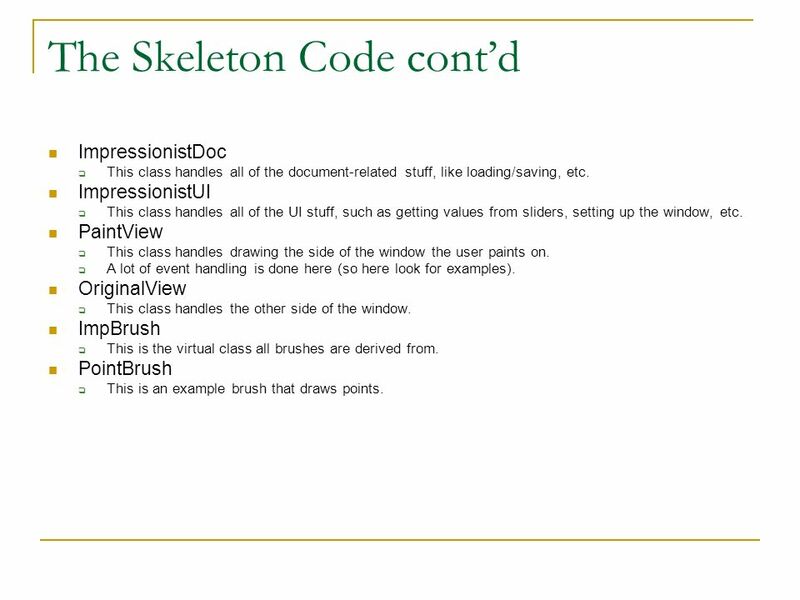 3 The Skeleton Code cont’d ImpressionistDoc  This class handles all of the document-related stuff, like loading/saving, etc. ImpressionistUI  This class handles all of the UI stuff, such as getting values from sliders, setting up the window, etc. PaintView  This class handles drawing the side of the window the user paints on.  A lot of event handling is done here (so here look for examples). OriginalView  This class handles the other side of the window. ImpBrush  This is the virtual class all brushes are derived from. PointBrush  This is an example brush that draws points. 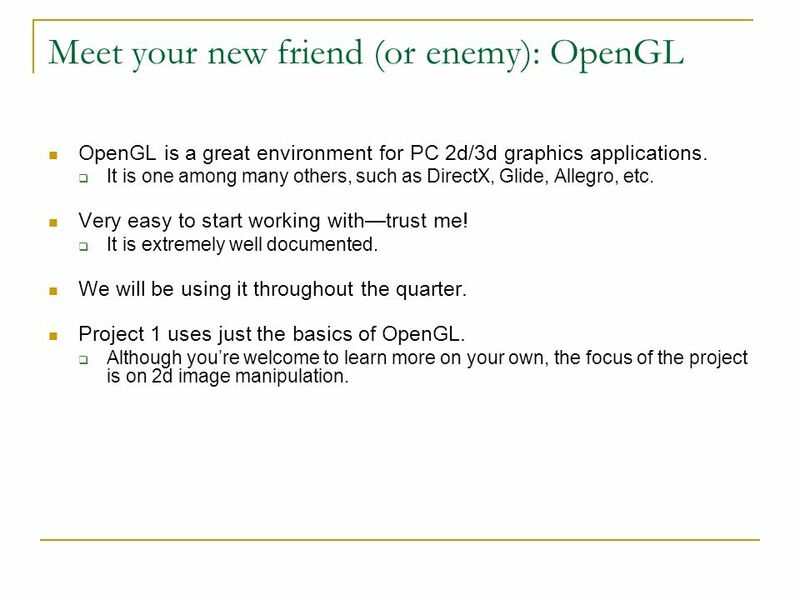 4 Meet your new friend (or enemy): OpenGL OpenGL is a great environment for PC 2d/3d graphics applications. 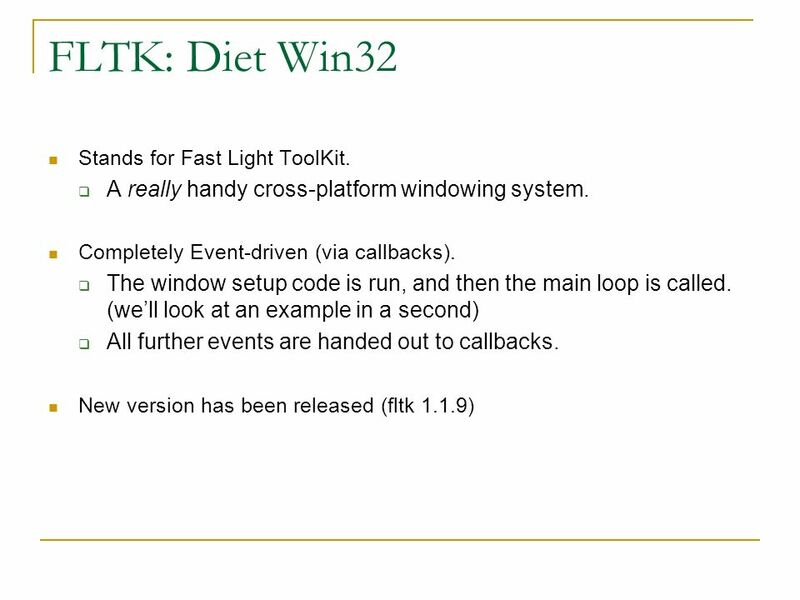  It is one among many others, such as DirectX, Glide, Allegro, etc. Very easy to start working with—trust me!  It is extremely well documented. We will be using it throughout the quarter. Project 1 uses just the basics of OpenGL. 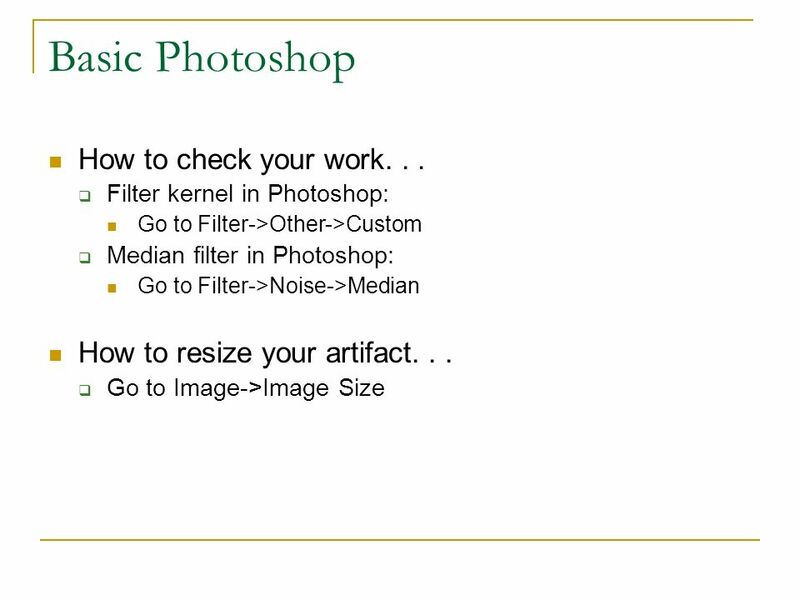  Although you’re welcome to learn more on your own, the focus of the project is on 2d image manipulation. 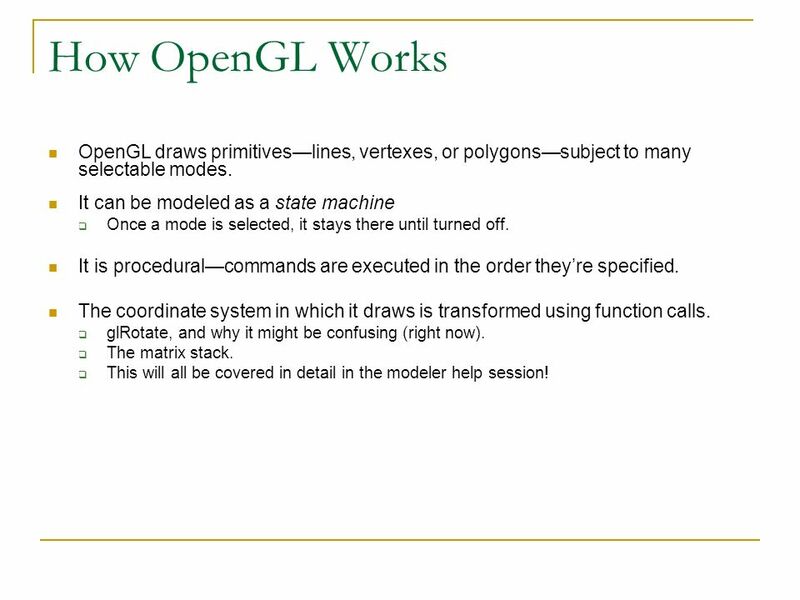 5 How OpenGL Works OpenGL draws primitives—lines, vertexes, or polygons—subject to many selectable modes. It can be modeled as a state machine  Once a mode is selected, it stays there until turned off. It is procedural—commands are executed in the order they’re specified. The coordinate system in which it draws is transformed using function calls.  glRotate, and why it might be confusing (right now).  The matrix stack.  This will all be covered in detail in the modeler help session! 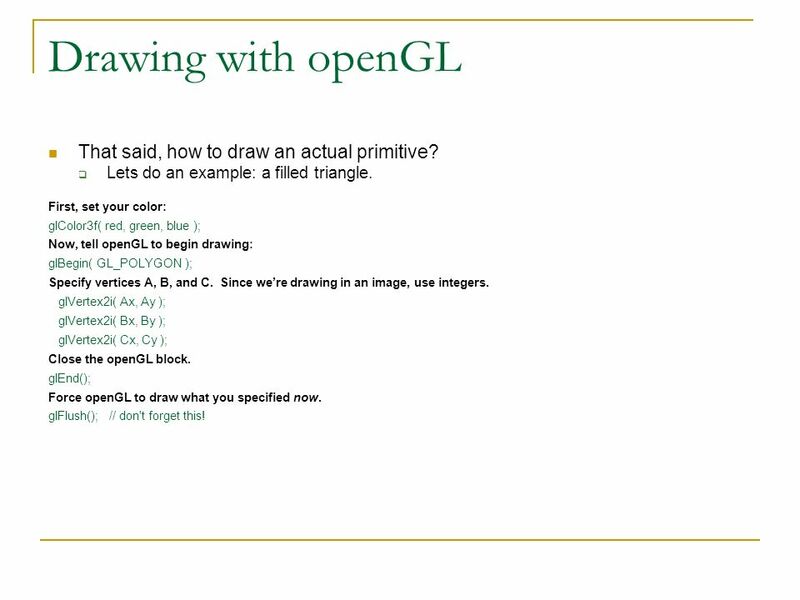 6 Drawing with openGL That said, how to draw an actual primitive?  Lets do an example: a filled triangle. First, set your color: glColor3f( red, green, blue ); Now, tell openGL to begin drawing: glBegin( GL_POLYGON ); Specify vertices A, B, and C. Since we’re drawing in an image, use integers. glVertex2i( Ax, Ay ); glVertex2i( Bx, By ); glVertex2i( Cx, Cy ); Close the openGL block. glEnd(); Force openGL to draw what you specified now. 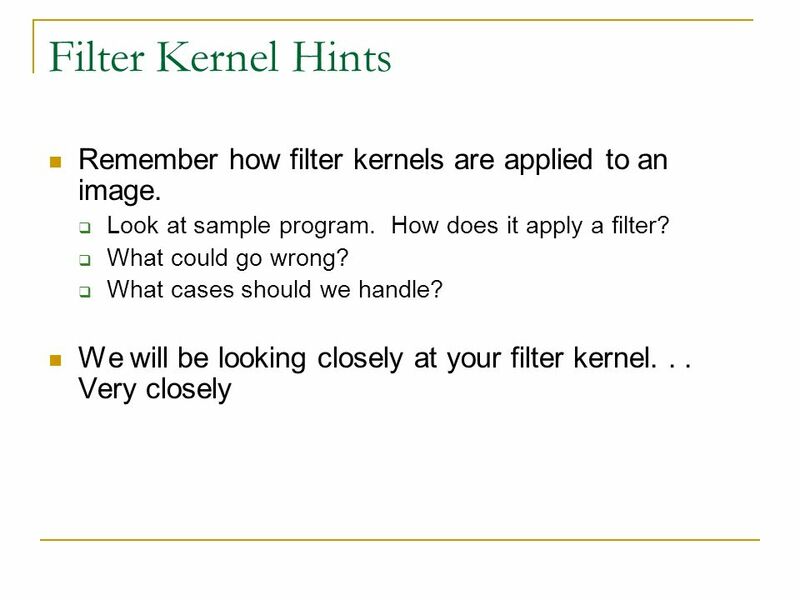 glFlush(); // don't forget this! 9 How to Make a Brush Now that we’ve got all the background, lets make a brush!  Presenting...triangleBrush! 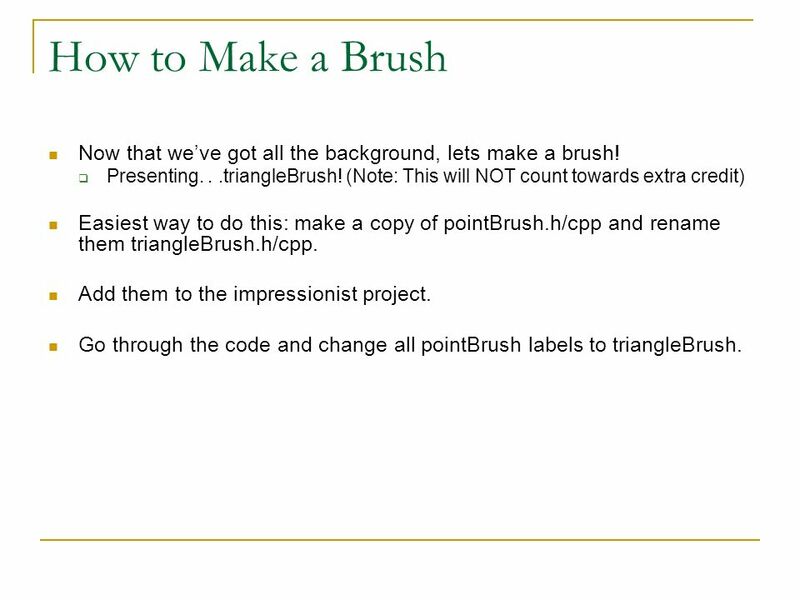 (Note: This will NOT count towards extra credit) Easiest way to do this: make a copy of pointBrush.h/cpp and rename them triangleBrush.h/cpp. Add them to the impressionist project. Go through the code and change all pointBrush labels to triangleBrush. 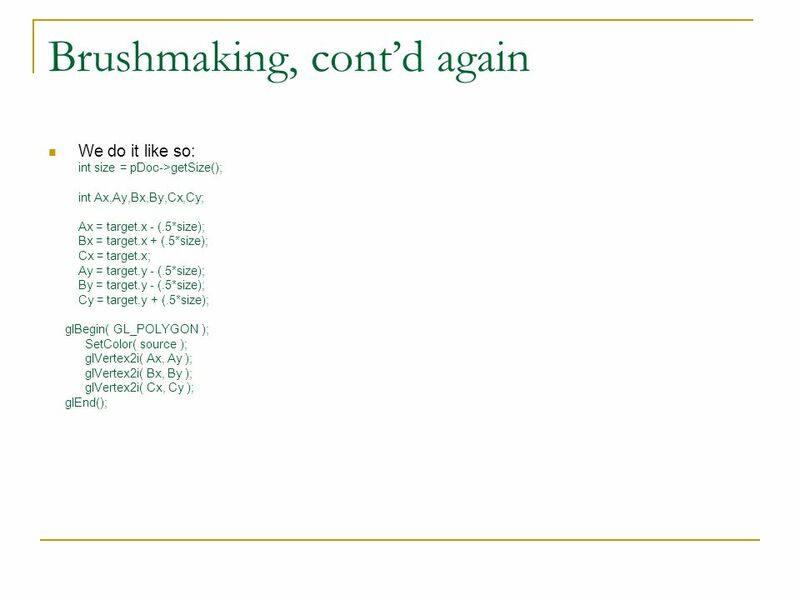 10 Brushmaking, cont’d Now, open up ImpressionistDoc.cpp Add triangleBrush.h to the includes Scroll down a bit, and add triangleBrush to the selectable brushes. Pick a constant for it. Go to ImpBrush.h and add the constant for triangleBrush to the enum. 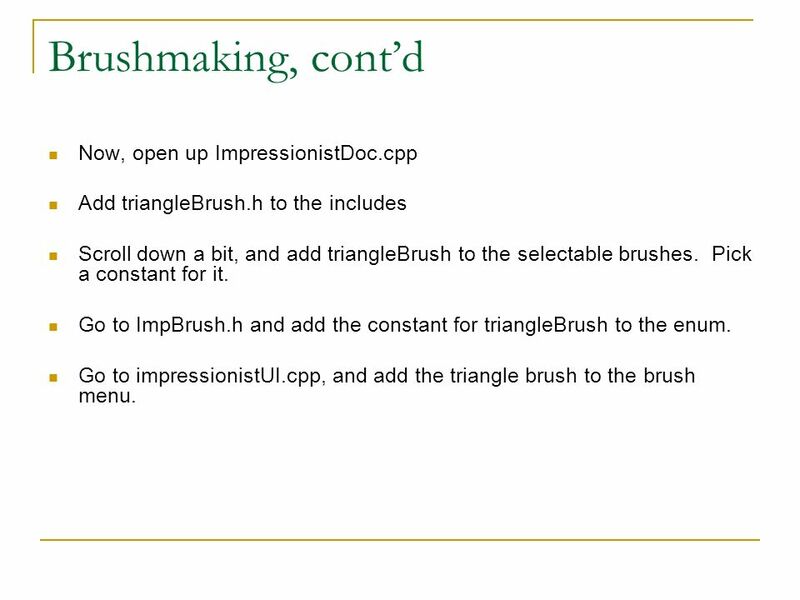 Go to impressionistUI.cpp, and add the triangle brush to the brush menu. 11 Brushmaking, cont’d again Run Impressionist. See the triangle brush.  And, well, see the triangle brush make points instead of triangles. 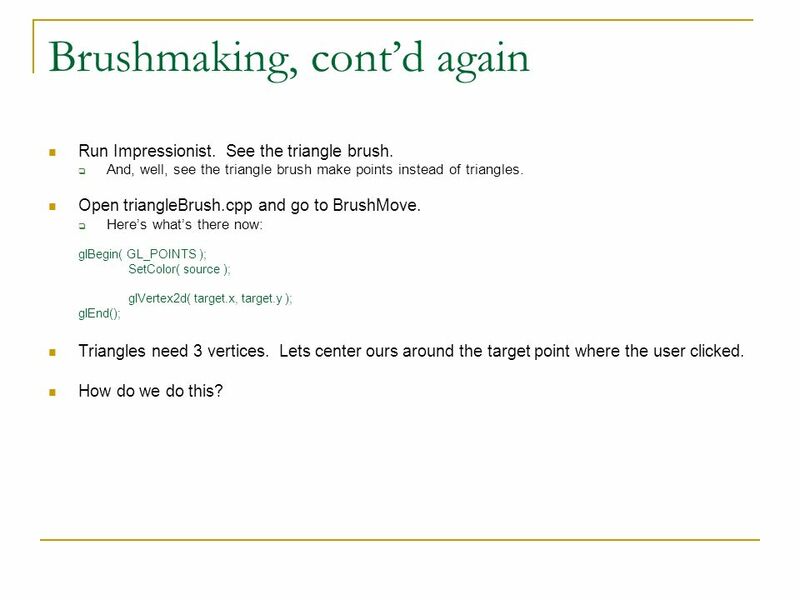 Open triangleBrush.cpp and go to BrushMove.  Here’s what’s there now: glBegin( GL_POINTS ); SetColor( source ); glVertex2d( target.x, target.y ); glEnd(); Triangles need 3 vertices. Lets center ours around the target point where the user clicked. How do we do this? 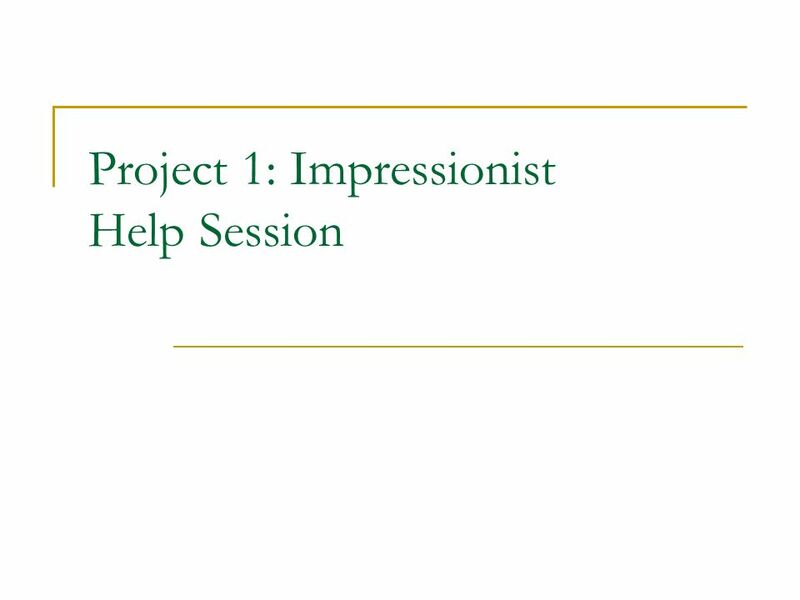 Download ppt "Project 1: Impressionist Help Session. The Skeleton Code." CSE 557: Impressionist Help Session Ian Simon. 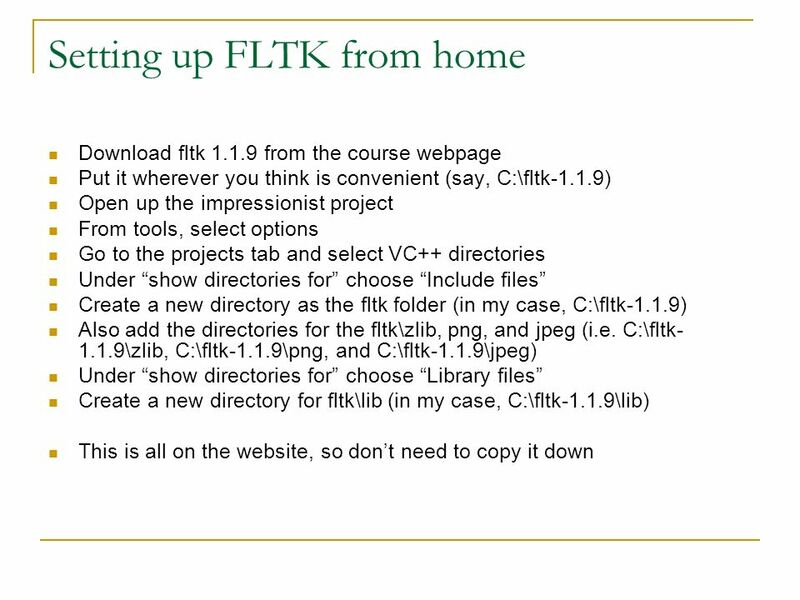 What we’ll be going over Getting Set Up The Skeleton Code OpenGL Basic FLTK How to make a new brush Good. 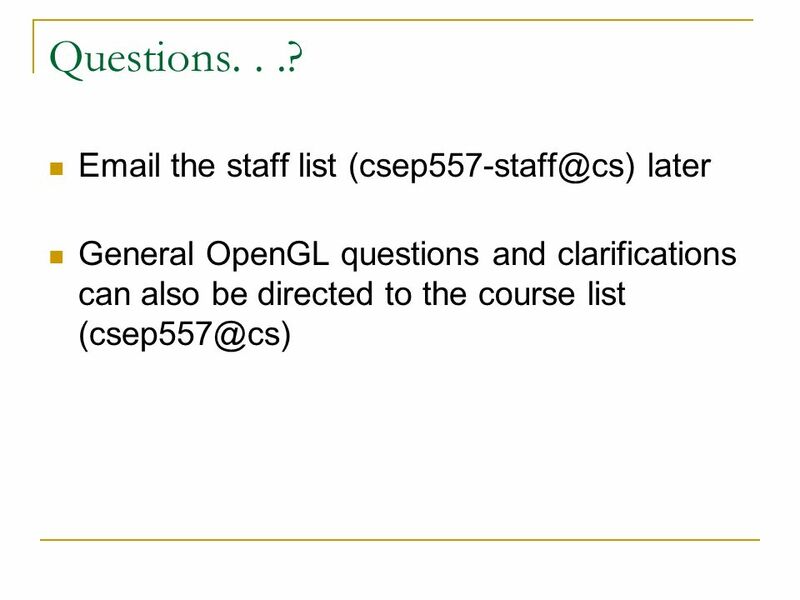 Lab 1: OpenGL Tutorial CS 282. What’s the plan for today? 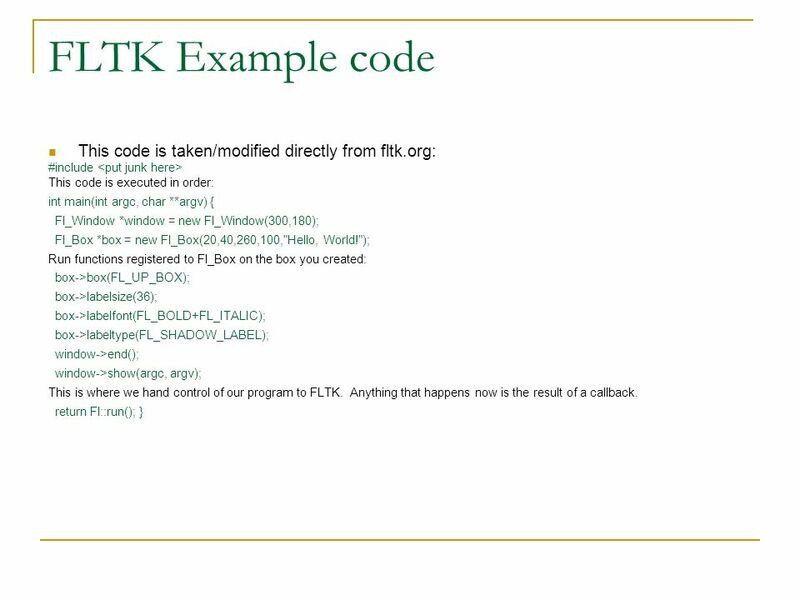 Go over our framework code. 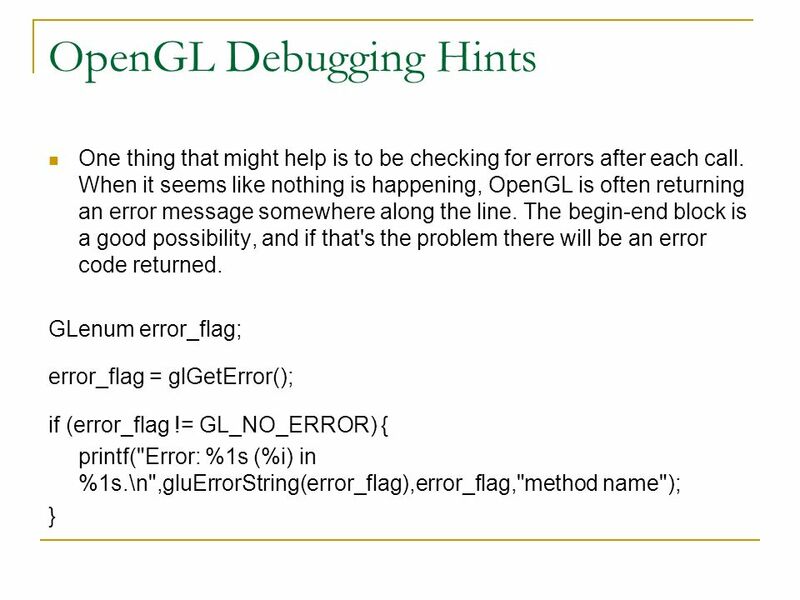 Learn some basic OpenGL! Reveal Lab 1 Answer questions. What is OpenGL? Low level 2D and 3D Graphics Library Competitor to Direct3D (the rendering part of DirectX) Used in: CAD, virtual reality, scientific. Animating With Blender Topics: Making a skeleton. Making a skeleton. Attaching the skeleton to your model. Attaching the skeleton to your model. Posing. CSE 557: Impressionist Help Session Keith Grochow. Project 1: Impressionist Help Session And your friendly neighborhood TA is… Young-Mi. OpenGL (I). What is OpenGL (OGL)? 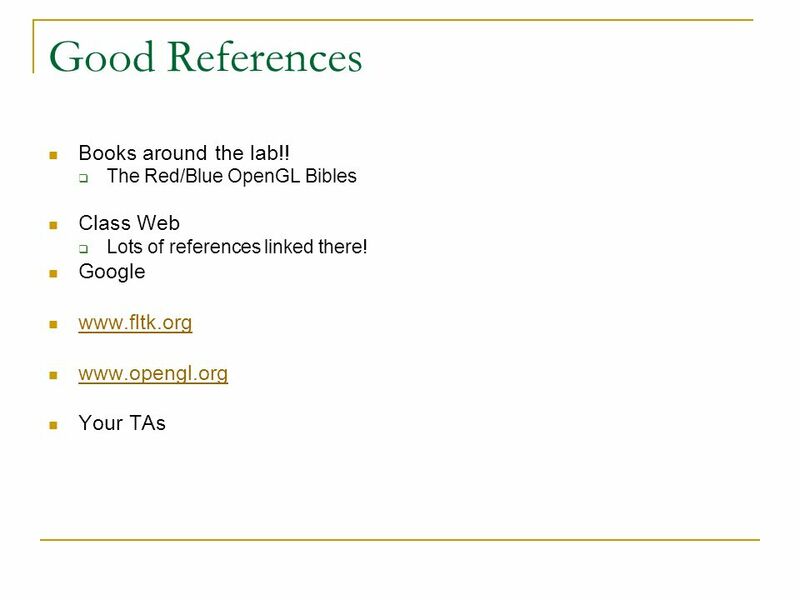 OGL is a 3D graphics & modeling library Can also use it to draw 2D objects. Painterly Rendering CMPS Assignment 2. OpenGL OpenGL is a cross-language, cross- platform specification defining and API for 2D and 3D graphics. CSE 457: Impressionist Help Session...And Your Friendly TA is: Steve Martin. LAMAD Symbian Qt install and deploy Installing Qt SDK and deploying Qt applications. Using School fusion A great interactive tool to aid in communication for students, parents and YOU!!! Property of TSVest 2006.